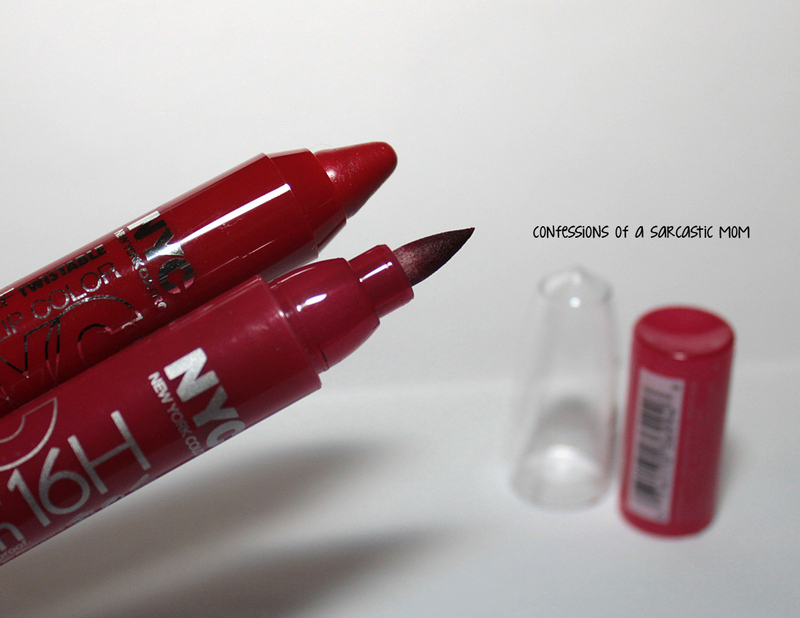 Two red lippies from NYC to brighten your day! I'm a huge fan of red lips. I attempt to wear a red lip as often as I possibly can! So when I can find good red lippies on the cheap - you know I'm all about it! 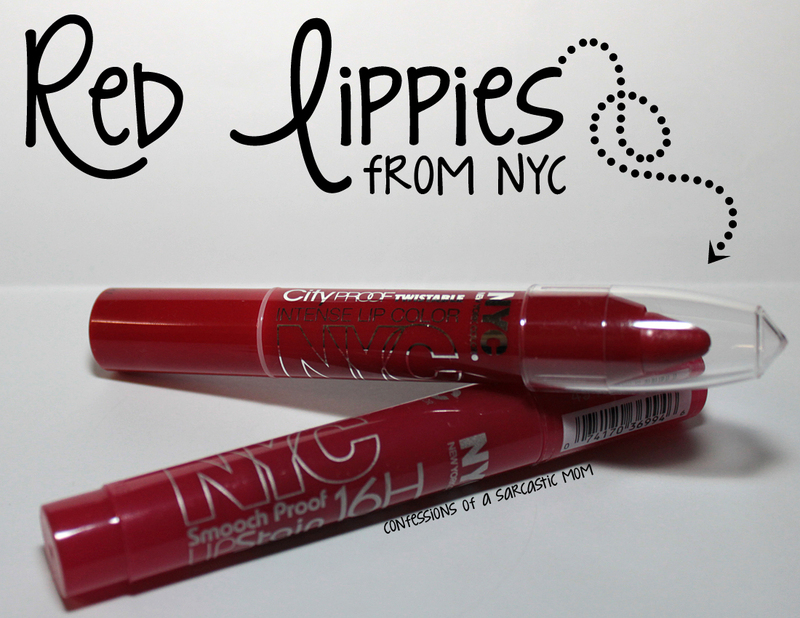 I've come across two NYC must-haves - City Proof Twistable Intense Lip Color in South Ferry Berry, a lip crayon, and Smooch Proof Lip Stain in Smooch Proof, a marker-type application. South Ferry Berry is a bright red across the board with a creamy finish. I get about 2-3 hours of wear time on these in my normal daily routine (meals and drinks, etc). I love lip crayons and pencils for the fact that they are simple to use and apply. Smooch Proof is a different entity entirely! haha It's not shiny or anything - it's pretty flat! It's completely and totally like using a marker. It's got a matte-like quality to it, and it's a deeper more blue-toned shade. But the weartime! Oh my. It certainly IS "smooch proof." I can get 8-10 hours out of this puppy. It does a great job on the "stain" end of the deal! Do you have a lip color that you lean toward most often? I've been told I look great in purples, but I rarely venture outside my comfort zone and wear it! 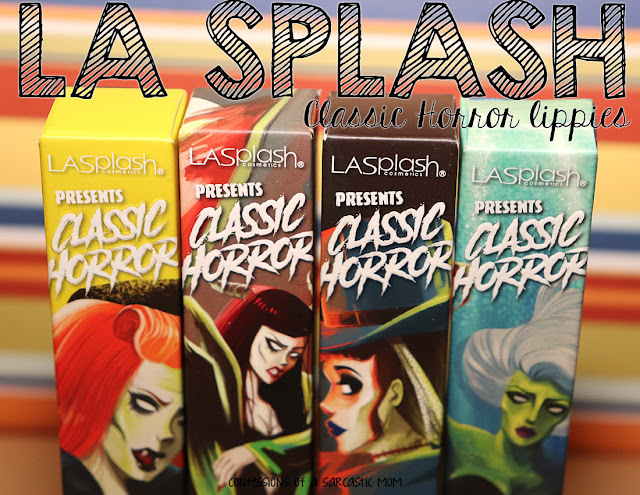 I found both of these at Rite Aid, but you can find them at a variety of places... wherever NYC cosmetics are sold! Price vary, but are generally around the $2-$3 mark. **DISCLAIMER** I was not paid for this review by anyone. I either purchased these products myself or was given it as a gift. Affiliate links are to Amazon.